You’ve seen them lead worship. Now you can hear them on iTunes and Spotify too. Meet CHC backup vocalists Maximilian Low and Carmen Ang, who have each launched their own singles. Maximilian Low performing his single “Lenses”. For as long as he can remember, music has always been a part of Maximilian Low’s life. The 27-year-old, whose stage name is Max Low, fondly recalls a time when he was only 6, lugging around a mini amplifier and belting out tunes from The Lion King. By the time he reached his teens, Low was very confident that he was going down the path of a music career. He has met with many comments and criticism along the way—all of which he takes in his stride. 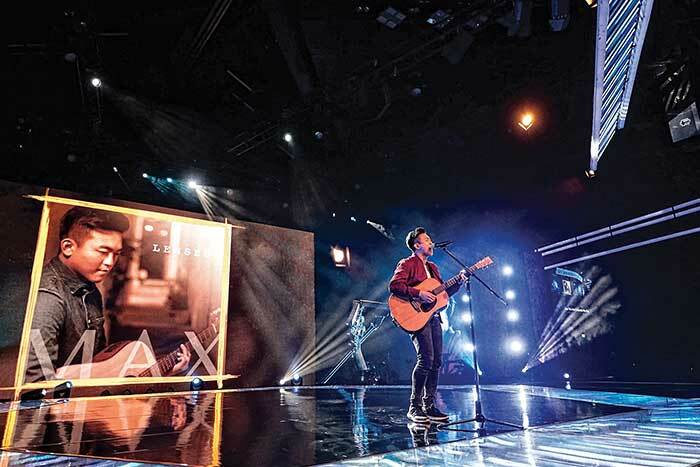 Low’s musical talent has blessed City Harvest Church: he is the writer of “Greater Are You”, “Generation” and “Rejoice”, three songs that are often sung during church services. It seems only natural, then, that he would write a song like “Lenses”, which he debuted on Sep 29 this year. Writing songs is a natural fruit of his passion and discipline. “I would say that songwriting is more of a skill and a habit than it is a talent. When I sit down to write a song, I often need to be quiet, away from the noise, and allow the Holy Spirit to speak,” says Low, who draws inspiration from his mentors in CityWorship as well as pop favorites like Bruno Mars, Ed Sheeran and Jason Mraz. His parents, fortunately, are “very giving and willing to let me make a path for myself, and they’re ready to catch me if I fall,” says the only child, adding that his mother even promotes his YouTube videos to her friends. Low first came to CHC at the age of 14, when a friend invited him to an evangelistic service at the Singapore Indoor Stadium. At the age of 15, he wrote his first song, about coming to a crossroads in life and overcoming difficulties. The guitarist shares that the inspiration for “Lenses” came from a February 2015 sermon preached by Dr AR Bernard at CHC. The single was written over three sessions before Low brought it to United Records. Producers Eric Wong and Careen Tham fell in love with the song and the trio worked for six months to arrive at the finished product last month. “I’m very grateful to United Records for believing in my song and my vision. They’ve labored with me through late nights and early mornings to bring this dream to pass,” says Low. Music has the ability to motivate and encourage the soul. Carmen Ang wrote “Stand Tall”, her first single, as a reminder to herself to lift up her eyes when she was going through a tough time. Earlier this year, Ang performed with Stefanie Sun at Shenzhen’s New Year’s Eve Countdown (2016/2017), which was broadcasted on Zhejiang TV. More recently, she was a back-up vocalist for the Sian Chay Charity Event in Singapore supporting artists like Vivian Hsu, Samuel Tai and Stefanie Sun. “Stand Tall” grew wings when Ang shared it with a close friend in the music industry, Ruth Ling, who then connected her to Shao Jean, a Singaporean who resides in Los Angeles and is a talented producer and songwriter. Ang and Shao worked on the song over Skype, before it was finally recorded at Red Roof Studio in Singapore, and released on Jun 23 this year. Ang has performed “Stand Tall” live on Power 98. The single enjoyed priority airplay and was on the airwaves for about two months. Max Low’s “Lenses” and Carmen Ang’s “Stand Tall” are available on iTunes for S$1.48 each. Support them by subscribing to their YouTube channels.